This is a very important general question in interviews. First of all you may look following table to identify main differences between Interfaces and Abstract classes. If you only have SRS, it is better to use interfaces. This is the first stage of creating an application. If application is being created partially, then it is better to use abstract classes. Every methods in interfaces are already public and abstract. Abstract classes may have both abstract and concrete methods. It cannot be used private, protected, static, final, native... with interfaces Any access or non access modifier can be used with abstract classes. Serialization cannot be applied to interfaces. Then lets move into real world problem. I'm going to create two concrete classes, one abstract class and one interface. Here you can see them. Then you may read this. This is very simple demonstration. I have mention three methods, eat(), walk() and work() In both Human interface and OtherHuman abstract class. You know, methods are called behaviors of objects. Then Employee can have all those behaviors eat, walk and work. But Student can have only eat and walk. Because I assume student don't have a job. When to use Interfaces and Abstract classes ? If you implement any interface, you have to override each and every methods which are in implemented interface. In this example if you implement Human interface to Student, then it have to override all those methods including work() also. You cannot avoid overrinding work() method if you are implementing Human interface. So this is the time to use abstract classes. If you use OtherHuman abstract class instead of using Human interface, then you can choose whatever methods which you need to be included to Student class. That is why I extended OtherHuman abstract class to Student class. Then I can override eat() and walk() without work() method. So I think now you have a good idea about the difference between interfaces and abstract classes. Hope you can understand. This is the third post under Spring MVC. In my previous posts I've mentioned following things. 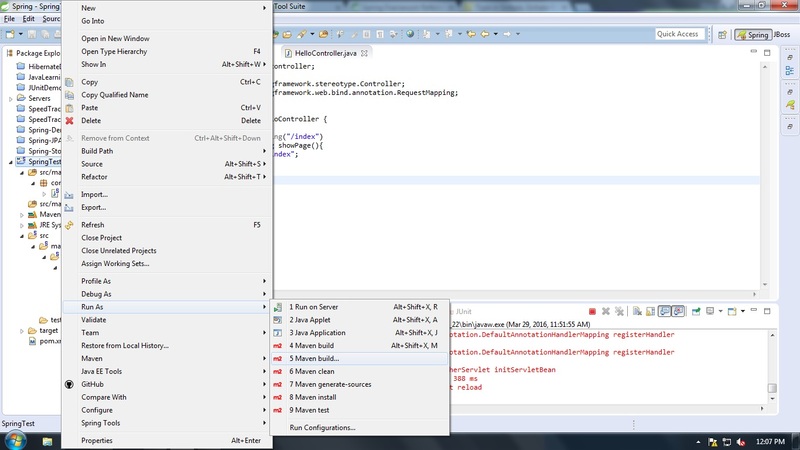 In this post I'm gonna talk about, how to create your first Spring MVC hello world program. This is very simple. I'm going to create one controller and jsp page to demonstrate this with xml based configurations. I can deliver steps as follows. 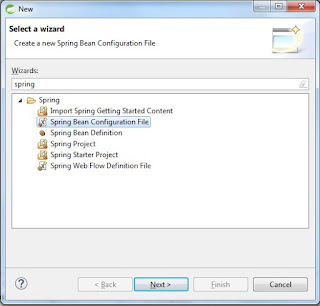 Go to Spring reference Here I'm using Spring 4.1.6.RELEASE. 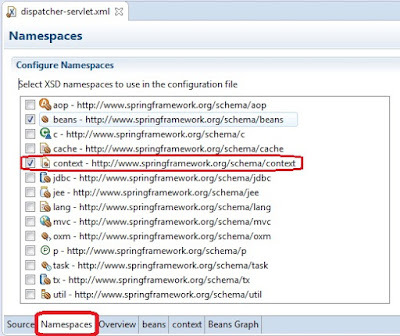 Under The DispatcherServlet section, you will be able to see url mapping for front controller. Add this code to web.xml and do changes as follows. 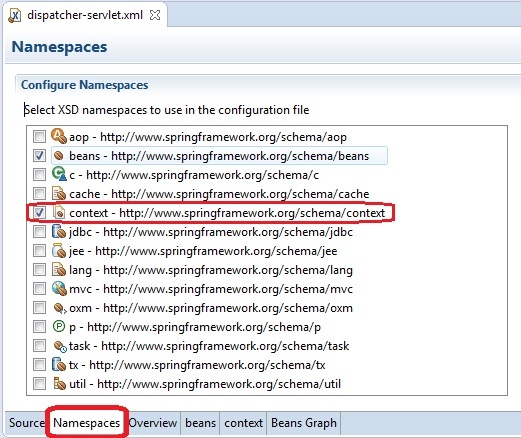 If you finished creating dispatcher-servlet.xml then you can add namespaces to the dispatcher-servlet using Namespaces tab. 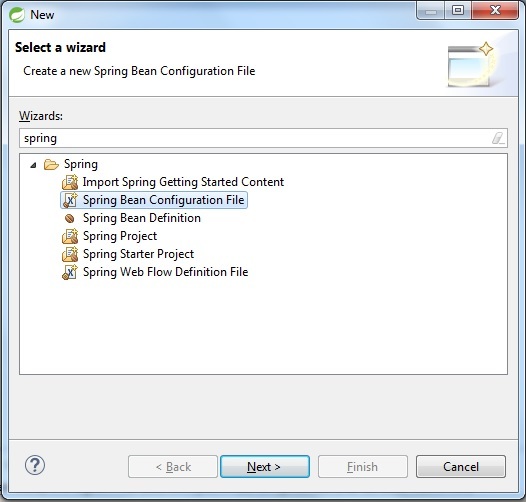 Then add following configuration and the view resolving bean. This InternalResourceViewResolver can be obtained by spring documentation. This view resolver is used to resolve view types in your application. There are few view resolvers, but I prefer to use InternalResourceViewResolver. If you like p namespace, you can create that bean in easy way. Both are same, you can use whatever you prefer. Finally your dispatcher-servlet.xml may look as below. 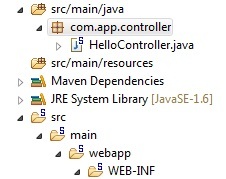 Create a simple java class in src/main/java folder. 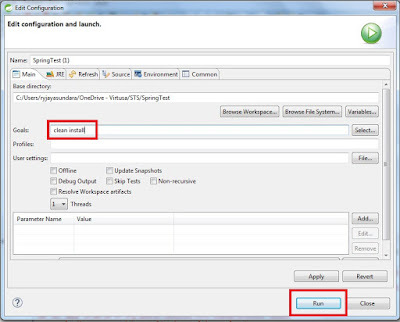 Then I create following method to use to view index page(I didn't create index.jsp yet). @Controller - This is used to make this class as a controller. @RequestMapping - This is used to map the browser request. 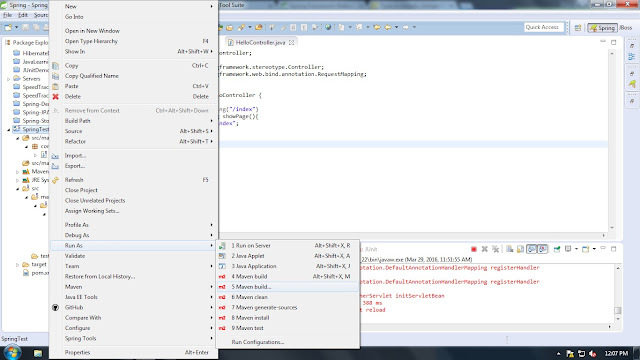 DispatcherServlet(front controller) obtain user request and send it to relevant controller according to this mapping. You can use any name as the method name in controller. 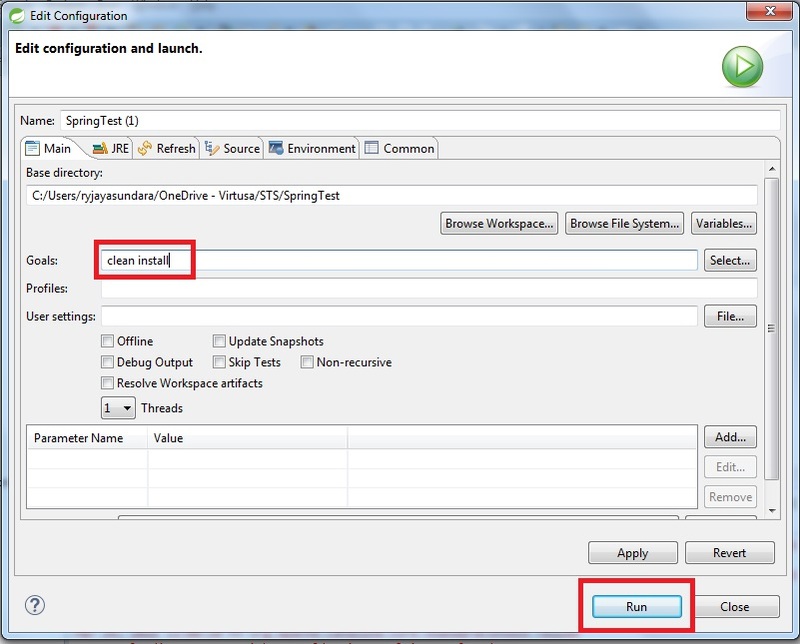 Then it returns the relevant jsp page, we have to create this jsp page. 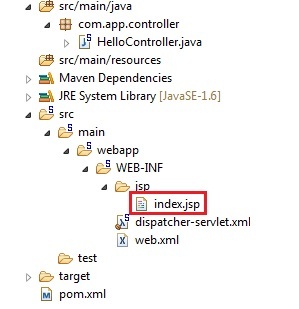 Create a jsp file in src->main->webapp->WEB-INF->jsp (I've created a folder called jsp in WEB-INF) Because we have defined this location in dispatcher-servlet. You can add something to your file to identify it. Your file name must be index.jsp. Because we return "index" in controller. Now everything is ok. Then you can deploy your project. Then type "clean install" in Goal. Then Run. Then right click on your project and then select Run As -> Run on Server(You have to create a server instance, here I've used Apache Tomcat ). Now You will be able to see the output. If you are getting any errors, please check again and rebuild.